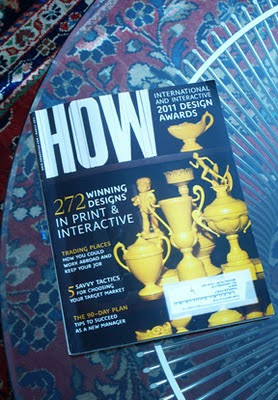 We just got our complimentary copy of the HOW Magazine 2011 International Design Awards and once again 3x3 is among the winners. And not just one winner, but three winners: Our 3x3 Directory: ILLO 10 and Issue 13, 14 and the 3x3 Annual No. 6 . Also among the winners was a series of issues of our sister publication, Creative Quarterly. This is the third year in a row that 3x3 has been honored by HOW and what makes it especially gratifying that our series of magazines were honored. As a judge I know how rare that is, too many times one or two of the three entries are great but the remaining are less so which will nix the entry—these judges saw strength in all issues. What’s also gratifying is that our judges are being exposed to the best illustrators around, as they thumb through the entries they had to be impressed by the quality and diversity of the work they were seeing. In our magazine, our annual and our directory. These are not only design awards for us, these are big announcements that illustration is alive and well and thriving. Since in each of publications illustration is king, not design, the very fact that judges three years in a row have honored us speaks well of the illustration industry. We’re only as good as the work we present. Our cover artists James Yang—ILLO 10, Nick Dewar—Issue 13, Lasse Skarbövik—Issue 14 and Marco Wagner—3x3 Annual certainly caught the attention of the judges as they sifted through the thousands of entries and provided a welcome greeting to what was inside. The judges had to be impressed with our publications cover-to-cover for them to receive this honor, so a great big thank you to them, and to all that were represented in our winning entries for making us look good. There were only 272 winners this year. This year’s judges included Clinti Runge, co-founder and creative director of Archrival whose clients include Red Bull, State Farm, Foursquare and Pabst Brewing; Richard Westendorf, executive creative director of Landor Associates who works on Kraft Foods, KFC, Wrigley and Procter & Gamble and Michael Osborne, president and creative director of Michael Osborne Design that works on the San Francisco Museum of Modern Art, Cooper-Hewitt National Design Museum and the Smithsonian.